A modeling and milling package tailored for general machinist. This product is ideal for production machining, rapid prototyping where ease of use and powerful toolpath generation methods are of paramount importance. 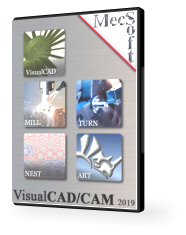 TURN, ART and NEST modules are included with this configuration of VisualCAD/CAM!